The Hoover Dam How did no one put this on the map?? The Hoover Dam, like the Grand Canyon, Mount Rushmore and those amber waves of grain that are…somewhere in the USA…is another one of those iconic American institutions that you should have to see in order to be considered a true American. I'm ashamed to say that I'm a bad American; I didn't even know where the damn Dam was. Idaho? Missouri? Iowa? No. Wrong, wrong and wrong. The backside of the Dam. Those four towers are call penstock towers and they control the dam's water flow. In fact, it's not too far outside of Las Vegas, straddling the border between Arizona and Nevada. Once we figured that out, we realized were going to drive right past it on our way from the Grand Canyon to Las Vegas. Surprised that no one had suggested the Hoover Dam on our map, we made the executive decision to stop and take a few pictures. 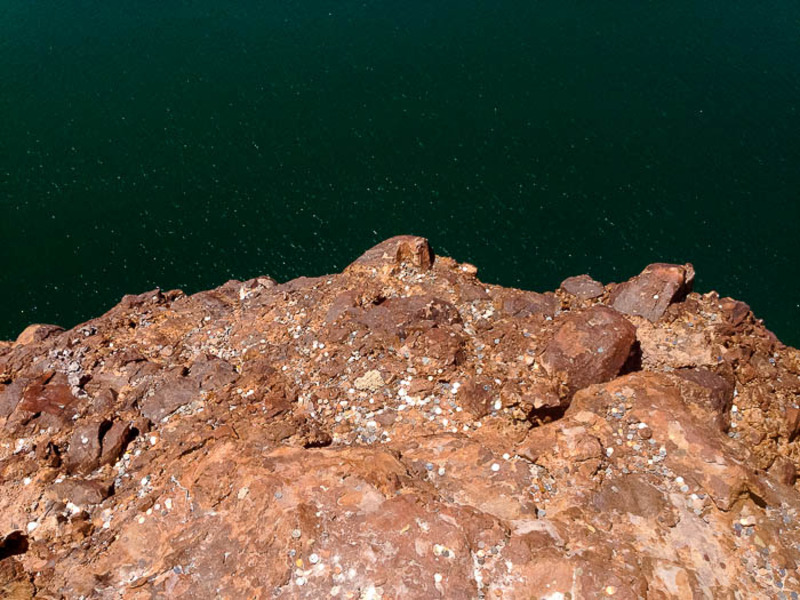 Tourists seem to think that if you throw coins into the Lake Mead side of the Hoover Dam, you'll have good luck. The Trevi Fountain of North America. We took the "Hoover Dam" exit off U.S. 93 and snaked up the narrow winding road that hugged rock walls, finally laying our eyes on the top of the Hoover Dam. Unfortunately the roads and guardrails had been conveniently built so that you can't get a glimpse of the dam in its entirety; you have to park in one of the tiered parking lots on the other side of the dam and walk down, otherwise walk along the highway bridge to see it from afar. We found a parking spot long enough for our 18-wheeler sized rig and walked down to marvel at the Hoover Dam. 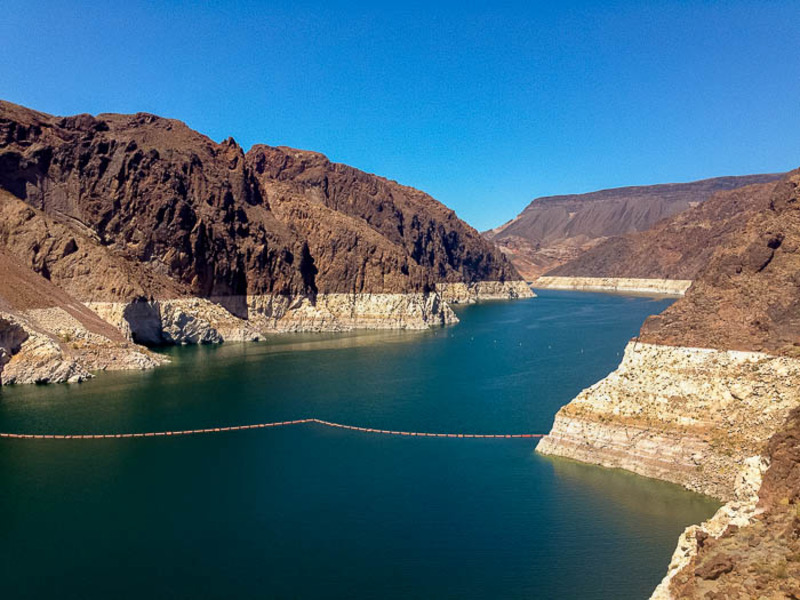 The lighter-colored ring on the rock walls surrounding Lake Mead is due to scary-low water levels. Due to the "no dogs on the Hoover Dam" rule, we were forced to marvel at this incredible feat of engineering from afar. But we had great views of Lake Mead and the four penstock towers, which control the dam's water flow. It was a quick visit to the Hoover Dam, but we were satisfied to have seen it and experienced a piece of American history. 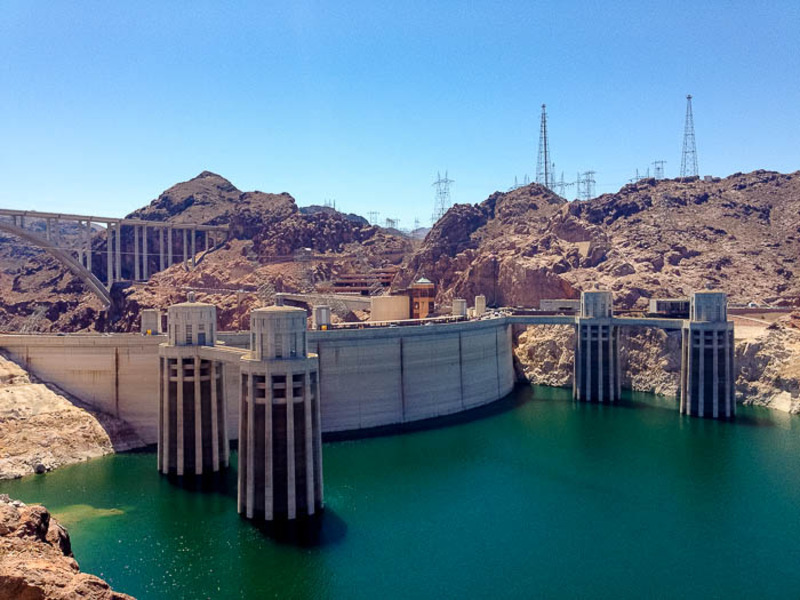 Fun Fact: There's enough concrete in the Hoover Dam to paved a two-lane highway from San Francisco to New York City!